Changing the way you shoot. The lens you need, precisely when you need it. Switch lenses on the fly, while you continue to shoot. Use the camera you want with the lenses you need, the moment you need them. Created by Cinematographer Ian Kerr, CSC. Design registered with the US Patent Office. The MultiTurret is still in the prototype stage. We’re in discussions with a number of partners to find the best way to bring it to you soon. WHY A MULTI LENS TURRET? -Switch quickly between lenses (prime or lightweight zoom) without an assistant, lens case or incurring the wrath of a director who won’t wait for a conventional lens change. -Select from multiple focal lengths while still using primes and the depth of field/ low-light capabilities they provide. -Select from a wider range of field of views (and speeds) than any zoom can provide. 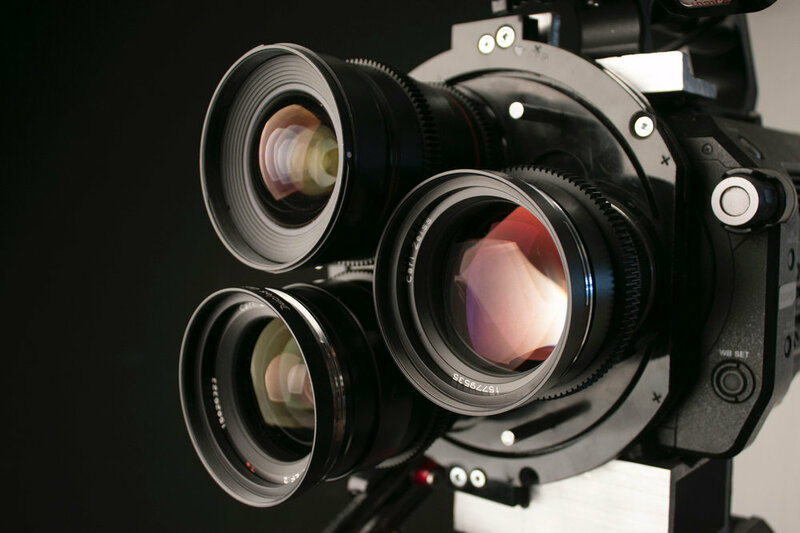 An example would be mounting 14mm, 35mm and 135mm high speed lenses. -The length , weight and centre of gravity of the system is reduced compared to larger ratio zoom lenses. Great for shooting in cars or handheld. -The MultiTurret allows for the conversion of lens mount types and camera mount types. For example, you could mount a PL mount lens, and EF lens and an F mount lenses on the same turret and switch rapidly between them. -Love that unique visual “swing” effect that occurs when you switch between lenses. -Customize your lens package for the scene you’re shooting. Wildlife at night? All long primes! In-car work? A short zoom, a 20mm and a 35mm or whatever you prefer. Throw a Swing/ Tilt or Lens Baby in the mix! -Finally, it looks cool. Really. ARE ELECTRONIC CONTROL AND COMMUNICATION WITH THE LENSES POSSIBLE WHEN MOUNTED ON THE MULTITURRET? Our latest prototype allows for full communication and control of EF mount lenses via Sony FS7 and A7S/R cameras and we’ll be testing Venice soon. We expect that we’ll also be able to convey metadata from PL lenses etc. via the MultiTurret. WHAT CAMERAS WILL THE MULTITURRET WORK WITH? Our prototypes have been designed to work with Sony FS7Mk2, A7S/R, Venice and other Alpha-mount cameras. We expect to extend support to Arri and Red shortly. WHAT LENSES WILL THE MULTITURRET WORK WITH? Our prototype has been designed to work with select EF mount lenses (including the electronic control of focus, aperture, etc) but PL , F , K and other mounts are likely also possible. Our prototype permits the installation of any Alpha-EF mount adapter (eg. Metabones) to achieve the Alpha-EF protocol conversions. No modification to the adapter, camera or turret is required. HOW QUICKLY CAN THE MULTITURRET BE INSTALLED AND REMOVED? Our prototype turret is installed on Alpha-mount cameras (Venice, Fs7Mk2, A7S/R) via the camera body lens mount and an additional bracket, with 1-2 bolts to support the weight of the system. The overall system will be designed to be installed or removed within 45 seconds. We’re looking at including the ability to add optical filters or auxiliary optics between the mounted lenses and the camera body. A7s/r users would love this we suspect. Right now we’re also looking for feedback so please let us know what you like/ hate. Ian is an Emmy award winning cinematographer and beard model. When he isn’t shooting, he invents and designs stuff like the MultiTurret.